The treatment options of Barrett’s esophagus depends on the grade of dysplasia. If no dysplasia is present, most authorities do not recommend treatment although there are certain circumstances were treatment may be advised. If low-grade dysplasia is seen and reproduced, many authorities recommend endoscopic treatment although they are times when a period of close observation is felt best. If high-grade dysplasia is present, most authorities would recommend some type of treatment which would include endoscopic procedures or surgery. If cancer is present, a much higher degree of concern exits and the best options for therapy will be based on a whole variety of information including patient age and health as well as endoscopic, radiologic and pathologic assessment of the tumor. The options for endoscopic treatment include radiofrequency ablation, endoscopic mucosal resection (EMR), contact ablation, argon plasma coagulation, and cryotherapy. Radiofrequency ablation, also commonly called BARRX or the Halo procedure, is a new endoscopic technique used for the treatment of Barrett’s esophagus. It is a technique that allows radiofrequency energy to be directed to the abnormal cells in an automated and controlled fashion limiting its tissue injury to the abnormal cells and preventing deeper normal tissue involvement. The ablation may be repeated over time until the entire area of abnormal cells are resolved. The entire procedure is performed as an outpatient under sedation provided by an anesthesiologist. Typically the procedure takes about 15-20 minutes. Post treatment, patients may experience mild pain and/or nausea for several days. These symptoms are easily controlled with medications. Patients are advised to adjust their diet for 24-hour hours after treatment followed by a soft food diet for several days afterwards. About 3 months after the treatment, a repeat endoscopy is performed to evaluate the effectiveness of the treatment and perform repeat treatments if needed. Effective acid control with a proton pump inhibitor is crucial during the healing process to assist with healing and prevent Barrett’s return. RFA can be delivered through a variety of catheters. Short segments or small patches of abnormal cells can be treated with a HALO 90 or Halo 60 device which is attached to the end of the endoscope and are about the size of a postage stamp. Even smaller patches may be treated by a through the scope method with Channel RFA. Larger segments are treated with a balloon technique called a HALO 360 Express ablation catheter which can treat up to 4cm at a time. Endoscopic mucosal resection is an endoscopic procedure used to remove small nodules, early cancers or segments of Barrett’s esophagus that are resistant to simple treatment. The Center utilizes both cap assisted and ligation assisted techniques. 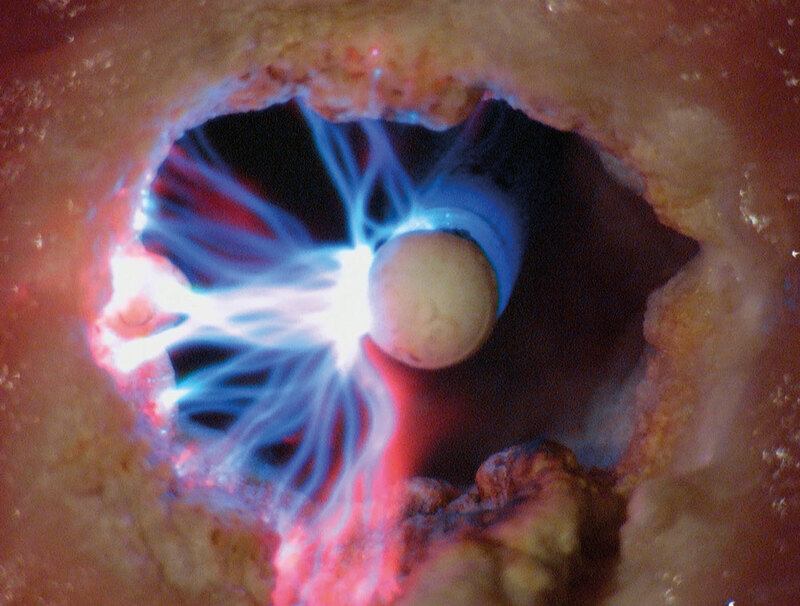 Using the cap assisted technique, a nodule is removed by endoscopically placing a tiny rubber band around the nodule forming a pseudo-polyp making it easier to grasp and remove with a cutting device. The procedure is performed during routine endoscopy with sedation. An advantage of the EMR technique is that the nodule can be removed in total giving the pathologist a whole specimen to evaluate rather than just a small biopsy. Endoscopic thermal ablation is an outpatient procedure that uses both laser and non-laser sources to thermally ablate the Barrett’s esophagus. Our center provides bipolar and monopolar electrocoagulation techniques to ablate tiny areas of Barrett’s that are not suitable for radiofrequency ablation or cryoablation. It is frequently used during routine follow-up procedures and can be performed with simple sedation. are also available. The Barrett’s Center also utilizes an Argon Plasma Coagulation (APC) system for treatment of Barrett’s esophagus (and watermelon stomach). APC system uses argon gas to deliver thermal plasma energy to the tissue adjacent to the probe. Electrical sparks are delivered at the tip of the probe ionizing the argon gas spraying the target tissue. APC is a non-contact thermal method that has been used for control of bleeding in the GI tract. The APC has advantages of ease of application, quick treatment of multiple lesions or a wide area. The pulsed APC Mode is a “smart” feature that auto-regulates, resulting in increased treatment confidence. APC is safe due to its limited depth of penetration, around 2-3 mm. The APC technique is often used for treatment of residual Barrett’s islands refractory to other treatments. Different APC probes are available allowing treatment of lesions around a fold not clearly in view, or an area not directly in front of the endoscope. Cryotherapy is a new technique that uses the extreme cold to destroy Barrett’s esophagus. Liquid nitrogen, CO2 and nitrous oxide are among available sources of extreme cold. The Center uses the through-the-scope Cryoballoon Focal Ablation system that consists of a battery powered handle, a balloon catheter and a cartridge that stores the liquid nitrous oxide. The system is programmed to deliver a preset amount of fluid inside the balloon after it is positioned within the Barrett segment during a routine endoscopy. The cryotherapy is maintained within the balloon catheter eliminating the need for venting of the gas from the esophagus and stomach. The system delivers more accurate treatment and is safer to apply in an outpatient procedure.